I have one brother who is 21 months older than me. For the most part, I think we are pretty similar. Growing up, he was more athletic and a bit more outgoing than I was, but we were both good students and neither of us was particularly rebellious. As adults, we have had fairly similar lives - both married in our early twenties; both have three children; both have similar beliefs and morals. My husband, on the other hand, is the oldest of five siblings and the five of them could not be more different. When we were dating and newly married, it was a complete mystery to me how five children raised in the same household could all be so dissimilar from one another. Then, I was blessed with three daughters who, like my husband and his siblings, are all very different from one another. 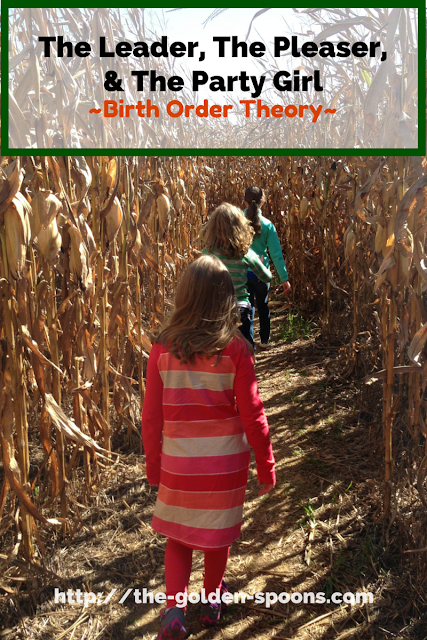 Because I was a child development major and because I'm always trying to understand my kids a little better, I did a little research on birth order theory several years ago. Now that my girls are older and have developed even stronger personalities, I decided it would be interesting to revisit that research and see if it seems to apply to my girls and whether or not it explains some of their differences. Birth order theory is, of course, the idea that the order in which children are born has a significant effect on their personalities and social characteristics. The theory suggests the following traits will be present based on the position children hold in the family hierarchy. Firstborn children are a lot like mini-adults. Because there was a time when they were the only children, they tend to be more like the adults who gave them undivided attention during that period. They are typically ambitious, reliable, controlling, and super responsible. They are achievers and perfectionists who want to be the best at everything. In contrast, middle children often lack a sense of strong identity since they are neither the oldest nor the youngest. Since they don't get "special" attention at home, they seek it out among their peers. They tend to be social butterflies and people pleasers. They are often seen as peacemakers who are cooperative and flexible. Finally, there are the youngest children - the last born. By the time these children are born, parents have become more relaxed and lenient. Therefore, last born kids tend to be rather free spirited and fearless. They are fun loving and outgoing. Since they receive a lot of attention as the "baby" of the family, they enjoy being in the spotlight and can be self-centered, manipulative, attention seekers. As with any theory, these are certainly not absolutes and there are a few factors that can skew the "typical" outcomes of birth order. One study proposes that at least half of a person's personality is genetic. It's just something you are born with that will not change regardless of your wrung on the family ladder. Gender also plays a role. For example, if your first is a girl, but your second is a boy, the boy is likely to display "first-born" characteristics because he is the first born male. Physical features can also play role. If the oldest child is also the smallest in physical stature, middle children or younger children may have more "status" and control. One article referred to this fourth variable as "specialness." For example, if one child is a musical prodigy or a star athlete, they may receive more attention than they would if they were "typical" children which could throw off the balance of the birth order theory. This also includes children with disabilities or special needs who require extra attentiveness regardless of their position in the order. Age gaps certainly play a roles as well. One article stated that 3-4 years between children is the "sweet spot" for this theory to be true. Children who are closer than that are more competitive and their roles can be a bit blurry. Conversely, if there is a gap of 5 years or more between siblings, the younger can really be almost like a second first born. Finally, special circumstances like blended families, adoption, and/or multiples throw a wrench into the usual outcome predicted by his theory. So how does this all play out for my girls? My oldest, Rachel, is the quintessential first born. She is an ambitious, perfectionist over-achiever. I often refer to her as an "old soul" which fits perfectly with the mini-adult descriptor. Even as a preschooler, she was happiest hanging out with the teachers rather than the other kids. She has friends, but is also perfectly happy being alone and has a healthy dose of genetic stubbornness. My middle daughter, Megan, doesn't fit the mold quite as nicely. As the theory suggests, she is a social butterfly and she is the most flexible, "go with the flow" kid I have. However, beyond that, the lines are a bit blurry. She is not a peacemaker and is not always the most cooperative kid. She has some characteristics of the "youngest child" as well because she is by far the most free spirited risk-taker of my crew. My youngest, Emily, is not a typical last born child at all. She is not self centered as the theory suggests (in fact, she is the most compassionate and concerned about others of all my girls) and she is definitely not a risk taker. She is actually the peacemaker in the family much more so than Megan, who, according to the theory, should play that role. Emily doesn't mind the spotlight from time to time, but she doesn't seek it out. She is super snuggly and loving as well, which is a trait this theory does't assign to any one child in particular, but it may be a small attempt at garnering some attention. Why don't Emily and Megan fall into the roles suggested by their birth order? I'm not sure. There are 28 months between my oldest and my middle. There are 32 months between my middle and my youngest. It's not quite the "sweet spot" of 3-4 years, but it's not that far off, either. There really aren't any other extenuating circumstances among them. They are all the same gender, have relatively similar physical statures, and none of them have any special needs. That only leaves their hereditary temperaments as a variable. Perhaps it is a case of nature vs. nurture or perhaps the birth order theory is just that - a theory. In any case, my girls are all unique and different. When you have multiple kids, it is so difficult not to compare them to one another, but I try to remember that they are each individuals with their own personalities and idiosyncrasies. Whether they fit the mold or not, they are exactly who they were created to be, they are mine, and I love them for who they are and for what they bring to my life. How about you? Does this theory apply to your children? Does it apply to you and your siblings? This post was part of the One Word Blog Linkup hosted by, Janine of Confessions of a Mommyaholic and me! This week, the word prompt choices were Mystery and Breathe.